Robots come soon not just in our bed, but also on the dance floor. Japanese scientists managed to build a robot that can dance with people. The MS DanceR or Mobile Smart Robot would be perfect, according to its inventors in dancing a slow and even a waltz. 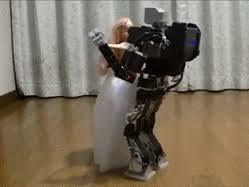 The dancing robot, created by a team of Japanese Tohoku University, can dance in close embrace with a human. Moreover, he is following the human movements by interpreting the pressure exerted by the hands on the back and shoulders of the robot.